Symphonic Variations, Scènes de ballet, A Month in the Country and Five Brahms Waltzes in the Manner of Isadora Duncan. Sir Frederick Ashton's first post-war work was both a homage to classical ballet and a response to the fashion for a more literary ballet repertoire. Symphonic Variations is a single act ballet for just six dancers, in an abstract style and with a minimal set by Sophie Federovitch. The Russian-born designer worked with Ashton on eleven ballets, beginning with his first work in 1926; he described her as "my greatest artistic collaborator and adviser". The original production in 1946 featured Michael Somes, Margot Fonteyn, Moira Shearer Margot Fonteyn, Pamela May, Brian Shaw and Henry Danton. This clip is from a later production. For Scènes de Ballet, Ashton devised geometric floor patterns for the dancers which can be viewed from all angles. Ashton said "I wanted to do a ballet that could be seen from any angle – anywhere could be front, so to speak. So I did these geometric figures that are not always facing front – if you saw Scènes de ballet from the wings, you'd get a very different but equally good picture." This production features Miyako Yoshida and Ivan Putrov in the lead roles; it was filmed in 2004 at the Royal Opera House. A narrative ballet based on the play by Ivan Turgenev, A Month in the Country was was first performed by The Royal Ballet on February 12, 1976 and is one of Ashton's final works for the company. The stirring music is by Fryderyk Chopin, arranged by John Lanchbery. The story is set in 1850, the year Turgenev wrote the play, at the country house estate of a Russian family; The narrative, which revolves around a series of domestic emotional entanglements, is driven forward by a series of pas de deux. 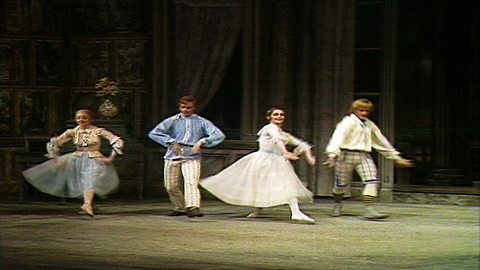 This clip features Lynn Seymour, Graham Fletcher, Denise Nunn and Anthony Dowell; the production was filmed in 1978 at the Royal Opera House. In Five Brahms Waltzes... Frederick Ashton celebrates Isadora Duncan, a pioneer of modern dance. Frederick Ashton had many influences, but the experience of seeing Isadora Duncan dance in 1921 stayed with him. Ashton said, "she had the most extraordinary quality of repose. She would stand for what seemed quite a long time doing nothing, and then make a very small gesture that seemed full of meaning". Tamara Rojo takes the role of Isadora in this production, filmed at the Royal Opera House in 2004.